It’s actually quite simple! Our residents enjoy just the right amount of holiday spirit in their space. Downsizing doesn’t mean tossing your décor. In fact, one of our residents said it best when she explained how she moved from 4,000+ square feet into her tiny home. As she prepared for her move she realized the number of things that she needed to part with over the years and the process was very cathartic for her. It’s all about the simple and subtle touches. Garland along the front porch, wreaths on the expansive windows, a menorah in the window and a few other decorations throughout your home and you’re living in a winter wonderland! 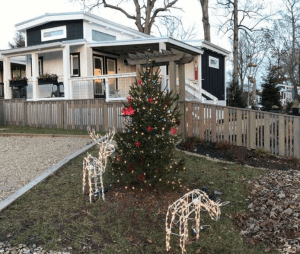 Our Simple Life community in Flat Rock, North Carolina even provides many of our residents with a picture perfect view of a real Christmas tree just outside their front door. What a perfect way to enjoy a Christmas tree without taking up too much space inside your tiny home. Traditional, classic and timeless decorations are on display throughout the Simple Life community in Flat Rock including the community’s stunning and beautifully decorated Clubhouse where many residents are gathering throughout the holiday season for events. The clubhouse Christmas tree is a focal point as residents were invited to place an ornament on the tree. From family photos to ornaments that correspond with the name of their tiny home, the tree is adorned with meaningful decorations and has become a tradition. It’s a time of year when family and friends also enjoy holiday classics and Simple Life is no different. The clubhouse has been a frequent “hangout” for viewing parties showcasing several classic Christmas movies on the large screen TV. Whether its peppermint bark, Buckeyes or Christmas cookies, you’re likely to notice the sweet smell of holiday baking as you drive through the community this time of year. Simple Life residents take immense pride in their kitchens and many have quickly realized that living a simple life includes being neighborly and delivering baked goods. It really is simple – meaningful memories created amongst neighbors and friends, purposeful decorating that brings warmth to each tiny home and new traditions that make living in a Simple Life community a wonderful experience. Add to that the peaceful view of snow throughout our community and it really is beginning to look a lot like Christmas…without all the extra and unnecessary stuff! Once again, another reason to live a Simple Life in peace and calm with just the right amount of holiday elements to celebrate the season. Because, after all, it’s not really the “stuff” that brings us joy. It’s about the people around us and the memories we create with our family and friends. As you make a checklist of all the “must have” decorations for your tiny home you may be wondering, “where do I store this stuff throughout the year?” Great question! Stay tuned… (storage blog coming in January 2019!